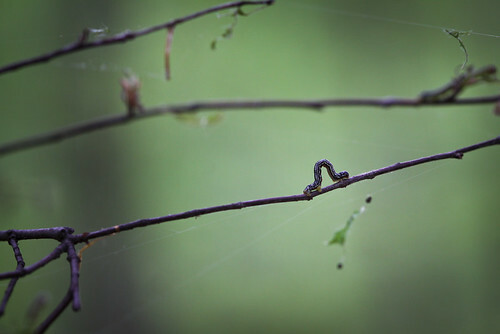 On Wednesday, I took a walk in the woods, looking for inchworms. 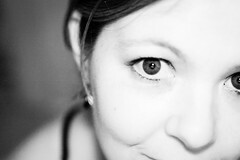 I was hurried and didn't find as many as I had expected. On Thursday, I went back, and got much more than I had bargained for. I'm not sure if there's a geometridae population explosion this year, or if I've just been fortunate not to have been in the woods on this particular day of the year in the past. It starts off slowly. You enter the woods and hear something that sounds like light, sprinkling rain on the leaves on the forest floor. 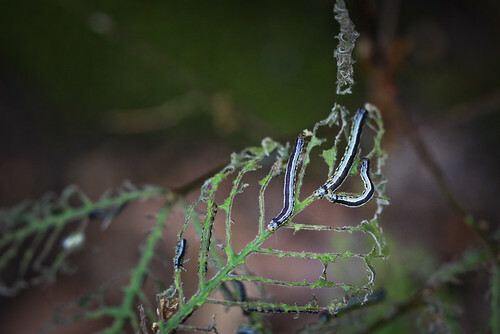 You spot the occasional green or black-and-green-striped inchworm on a leaf. 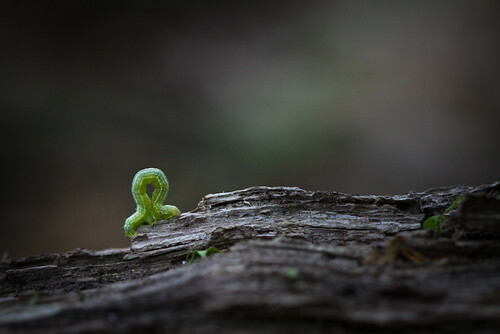 Then you feel a tickle and look down to find an inchworm crawling up your leg. So cute, right? Next you see bigger caterpillars. Not quite as cute, but still very entomologically interesting. Yay, nature. Tra-la. You look up and see that the caterpillars have friends. Still not so big a deal, just impressive to see all of them munching away at once. Until you realize just how many of them are munching at once, and start wondering about that light drizzling sound. Is it raining caterpillars? 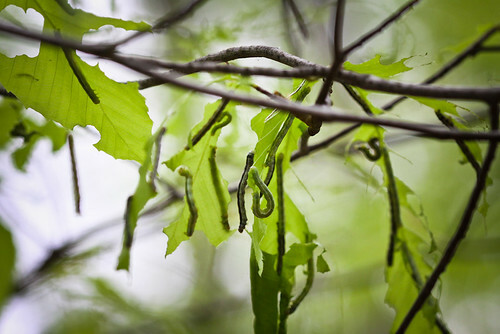 This sight is probably enough to send a squeamish caterpillar-hater back out of the woods. For the amateur entomologist, though, it's very exciting. WOW. Look at all those caterpillars. Look at how much of the leaves they're eating. Duuuuuuude. It reminded me of the inchworm song - 2 and 2 are 4, 4 and 4 are 8...except in this case we're just a little farther along in the geometric sequence. More like 1048576 and 1048576 are 2097152. 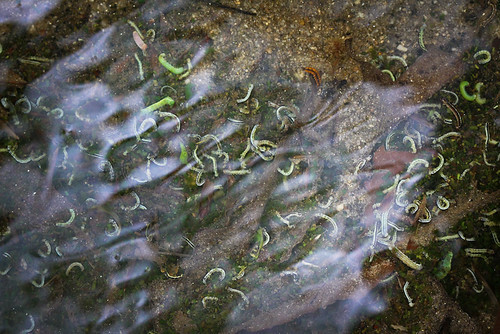 Even the little stream in the middle of the woods is filled with caterpillars. 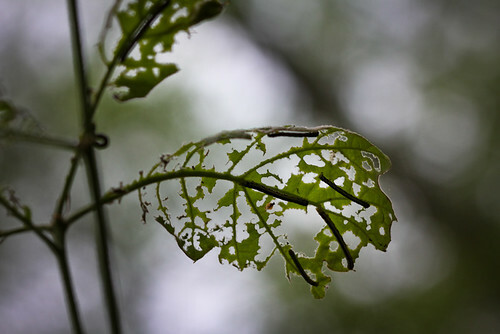 As you progress further into the forest, you start noticing the leaves, or what's left of them. Still very impressive. Very impressive. Also beautiful, in its own skeletal way. As you continue to look around, you realize the extent of the defoliation. 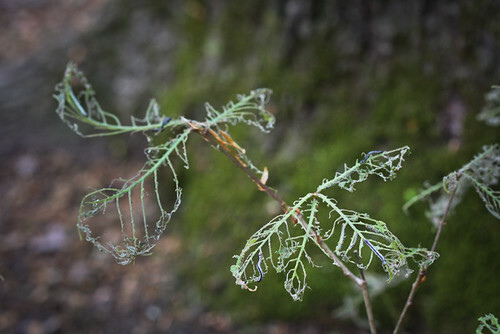 Having eaten every vestige of green from one tree, the larvae crawl along branches, drop to the ground, swing on silken threads in search of more food. 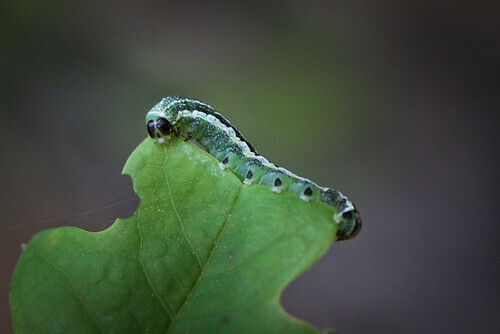 I'm accustomed to thinking of caterpillars as eating only one type of food - the leaves of the host plant. Swallowtail caterpillars will typically refuse food from very similar sources in the same botanical family, although I have observed some switching to closely related plants when faced with the elimination of the original food source. 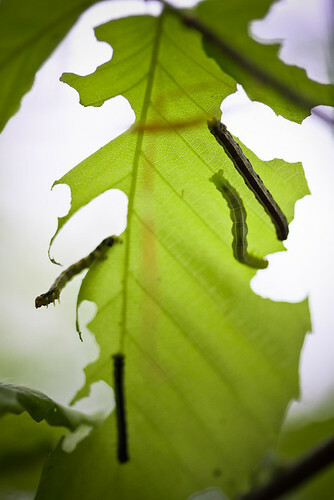 I was surprised to find that while the caterpillars seemed to prefer trees that I think are beech (need to bring my field guide to the woods next time), they were moving on to tulip poplar, maple, and even holly and pine trees. All of that eating cannot be without consequence, not only for the trees, right? It occurred to me what the sprinkling, light rain sound was, and I started looking for evidence. Frass. 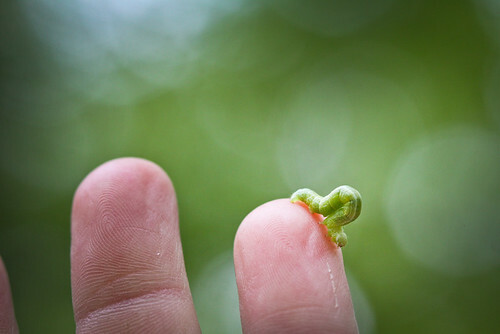 Caterpillar poop. What looks like poppy seeds on the leaves above is lots and lots and lots of caterpillar poop. As I started looking for it, I realized that the entire forest was literally covered in it. Leaves on trees were sprinkled as if with pepper. 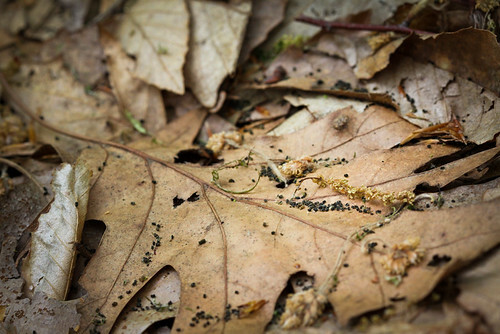 Small drifts rested in the creases of dry leaves on the forest floor. 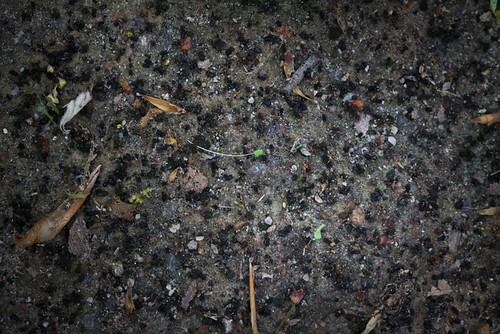 The ground is speckled heavily with it. Somewhere in among realizing that everything (including me) was covered with poop, dodging dangling larvae, and plucking them off my clothing, skin, and hair every few steps, I reached my lepidopteran breaking point. The bug fan fled from the woods, pausing only when the sprinkling sounds faded into the background. I think I'll stay out of the woods for a week or two, until the majority of the squirmers have made their cocoons and a rainy day or two has washed away some of the poop. Adios, inchworms.